During the fall of 1998, I was in search of an indestructable watch for use by members of law enforcement and the military. I had some very specific operational requirements for this timepiece. As I conducted my search, I mentioned my efforts to William Massena, a frequent contributor to TimeZone. He suggested that I contact his good friend Pierre Halimi-Lacharlotte, president of "Wings of Time," and also the North American distributor of Bell & Ross. When I told Pierre what I had in mind, he became very excited about the prospect of producing a watch for the American law enforcement market. He told me that the German Border Commandos already had an exclusive watch that had been designed for them. 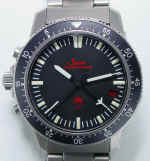 Pierre told me that I should definitely take a look at the Sinn 503EZM.1 and see if it would fulfill our requirements. When I finally received a specimen of the EZM, I was quite unprepared for the clean lines and strict utilitarian styling. Now here was a watch that didn't play any games. Just like the Heckler and Koch MP-5 carried by the SWAT Team, here was a watch that exuded German practicality and precision. I was immediately on the phone with Pierre, "I must have this watch!" "Sure," came the reply. But I warned Pierre, as wonderful as this watch was, there was no way that local government would spring for a $2,500 watch, SWAT or no SWAT. Pierre understood this at once. 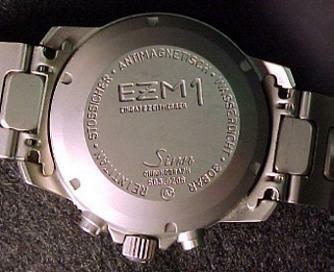 What followed was a collaboration to bring to the United States, a watch that would be economically viable, yet still carry many of the features of the 503EZM.1. While it is too soon to tell what the future holds, one thing is for sure, there are some exciting new developments in store for an expanded EZM line of watches. 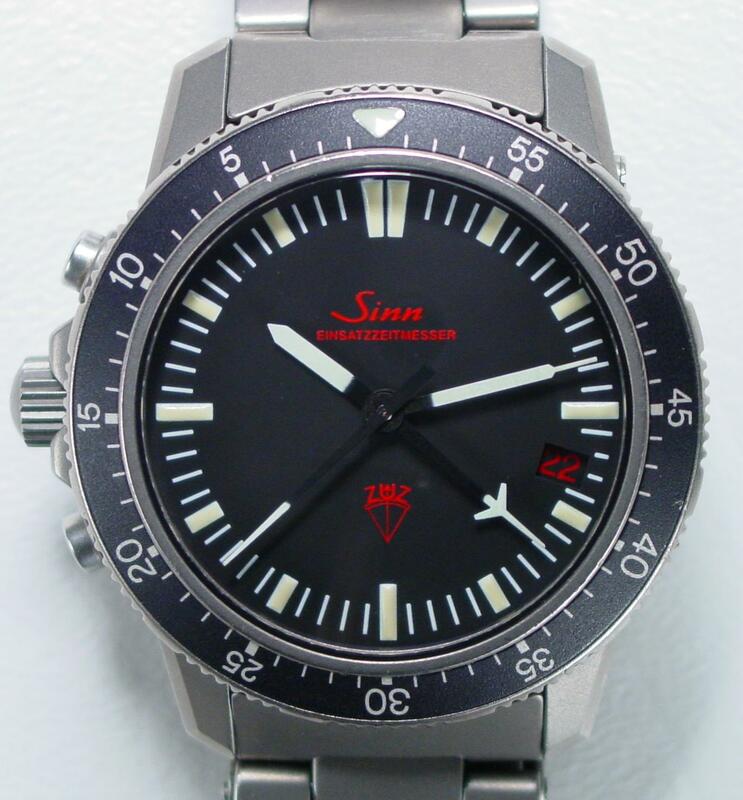 In the meantime, the original 503EZM.1 remains the flagship timepiece of this great line from Sinn. The EZM is available with either a titanium bracelet, or several strap options including natural buffalo, as well as synthetic straps. The premier close quarters combat weapon for elite units worldwide. They feature a delayed roller-blowback mechanism for superior accuracy with a minimum of recoil. This variation has a telescoping stock and a three shot burst mechanism in addition to full-auto operation. 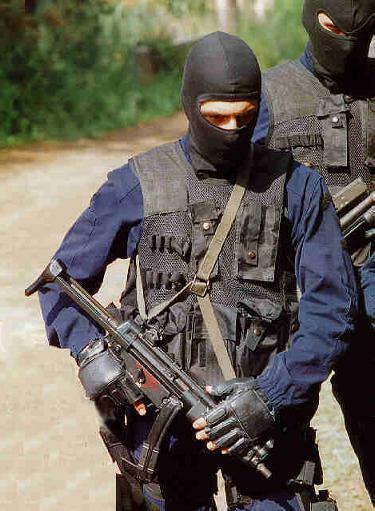 The EZM (Einsatz Zeit Messer) series was designed for elite German law enforcement units, Grenzschutzgruppe (GSG-9) Federal German Border Commandos, and the Zentrale Unterstützungseinheit Zoll (ZUZ). The EZM1 is utilized by the specialized ZUZ Unit. This unit is a special law enforcement arm assigned to the Federal Minister of Finance. The ZUZ Unit deals primarily with high-risk customs investigations, organized crime and drug interdictions all over Europe. In 1995, the head of the ZUZ Unit contacted Lothar Schmidt, the owner of Sinn, and requested a watch to be made especially for their unit. Meetings were held and sketches were produced. The first design sketch called for a power reserve, however, this was never realized in the production run. Sources indicate there were only 22 watches originally made for this unit. 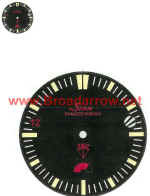 Instead of the red "3H" marking, these original issue watches were adorned with the ZUZ Unit logo, a bow and arrow, according to an old Indian legend. Here is a rare look at one of the issue watches. These watches were never sold and are only presented to members in good standing. UPDATE (2 October, 2003): It is now my belief that the EZM-1 series was issued originally only to the ZUZ Unit, and not the GSG-9 as widely reported. The EZM-2/Hydro appears to have been issued to divers of the GSG-9. The greater fame and marketability of the GSG-9 name appears to have been the primary influence behind the claims of GSG-9 issuance. Nonetheless, the ZUZ Unit is still an elite, and formidable team in its own right. After speaking to the director of the ZUZ Unit, it appears that of the 22 original watches, a few did indeed make it into the hands of collectors. At least four of them have been thus de-serviced. All of these have two or three digit serial numbers. It has also come to my attention that a few are being offered as "limited edition" issue watches on Japanese watch sites. I've been assured by the ZUZ, that permission was never granted to offer watches bearing their logo. At least one of these watches offered for sale bears a high four digit serial number. This is indicative that perhaps Sinn themselves marketed a few as "surplus" without the express knowledge or consent of the ZUZ. The total number of Sinn ZUZ dialed EZM watches sold by Sinn to the Japanese market is unknown, however, the total number is quite low. 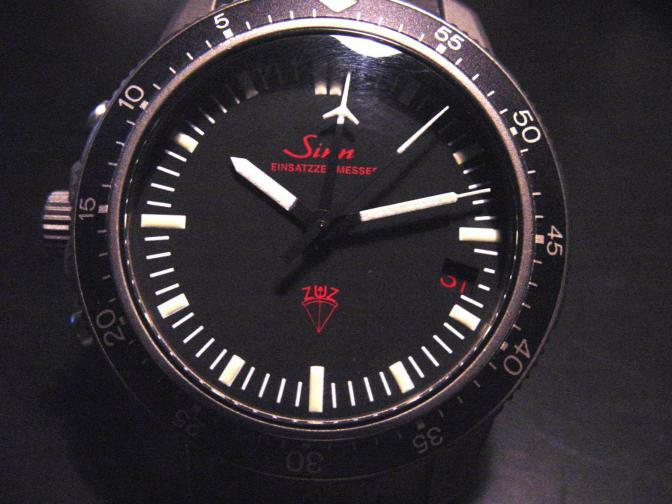 Sinn has been very careful not to market these to the Western world. There is no indication that any of the watch dials have been faked. The EZM-1watch will most likely go down in history as the GSG-9 watch. At this point, it has met the same fate as the fabled, and similarly misnamed "Longines Greenlander." UPDATE (14 October, 2004): Additional research indicates an adjunct branch of the Zoll KrimZollkriminalamt (ZKA), the Customs Central Technological Group (ZTZ), also commissioned the EZM-1 series of watches for issuance. Sinn made a total of ten ZTZ dialed EZM-1s. Of these, three were of a rare, right-sided crown arrangement. One ZTZ watch was reported lost during use. There are now known to be just nine ZTZ variants in existence. The case of the 503EZM.1 is constructed out of pure titanium. The crystal is domed anti-reflective sapphire. The movement is a derivation of the venerable Lemania 5100. The Lemania 5100 is often selected for Military watches because of its reputation as an extremely rugged, yet accurate performer. For faster reading and legibility, the registers and counters have been removed. All that is remaining is the minute and hour hand, along with the minute and seconds hand for the chronograph function. The chronograph is capable of timing up to one hour and 59 seconds. The hands, minute chapters, and bezel indicator are coated with tritium (3H*), making legibility excellent in the dark. A further innovation is the bi-directional bezel which serves as a countdown timer rather than an elapsed time indicator of most dive watches. 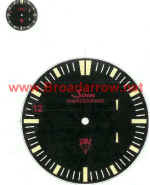 In this way, the chronograph and countdown bezel can be utilized independently. The lettering and date indication are printed in red. This subdued format is aesthetically pleasing, and all but disappears in a tactical environment. This minimizes distractions during critical operations. A special manufacturing process is utilized, and the entire case is filled with argon gas. The argon gas helps to eliminate any ambient moisture that may be present in the manufacturing environment. The gas also minimizes surface corrosion and helps to keep lubricants from breaking down over time. The gas can prolong the time between service intervals. The watch is also equipped with a copper sulphate dehumidifier device. This exclusive system eliminates condensation under temperature extremes. Additionally, this watch does not need to be checked for water integrity in the traditional sense because any incursion of water will turn the indicator bright blue, while at the same time minimizing water damage. The pushers were intentionally placed on the left side to make timer actuation easier. The pushers will not interfere with normal wrist action and when bending during exertion, including rappelling, and shooting. The fliplock titanium bracelet adjusts easily with a screwdriver. There is also an integral expansion link to facilitate wear with a wetsuit. The water resistance of this watch is 300 meters. weight = 61 grams. This is exclusive of the strap or bracelet. date: At the 1600 position. *As of 2002, the 3H logo has been replaced by an "Ar" logo. 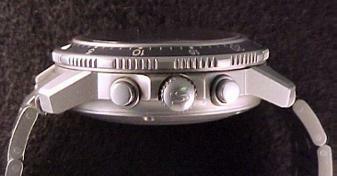 The hands and dial no longer contain tritium, having been replaced by Luminova (Strontium Aluminate). The rugged 503EZM.1 will definately allow you to push the envelope. 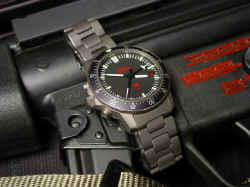 It is recommended for tactical operations or for any use where a tough and accurate watch are called for. 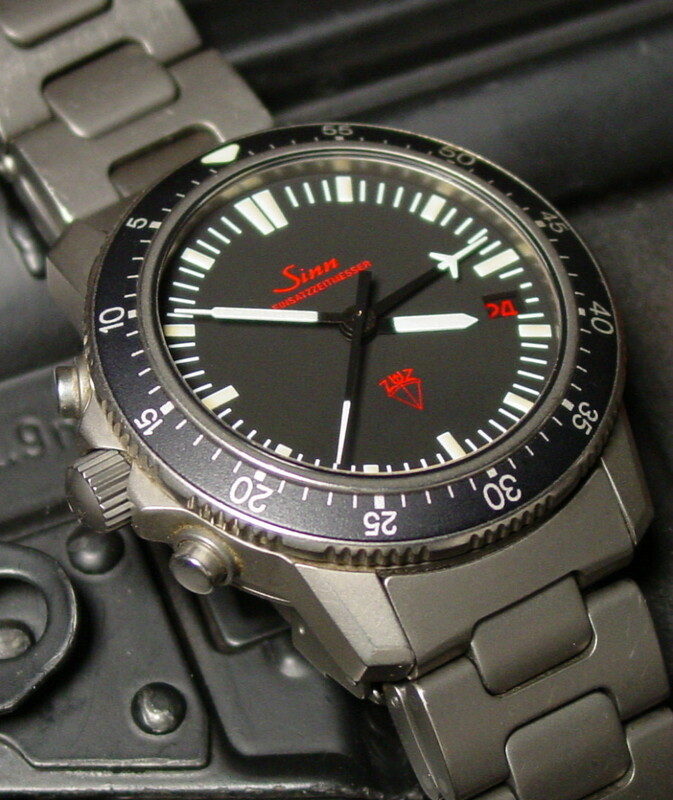 The 503EZM.1 is not normally sold in the United States by Sinn. A few have been imported by special arrangement with "Wings of Time," the exclusive distributor of Bell & Ross and Sinn watches in the United States. This arrangement was terminated in 2000. EZM1s must now be obtained from Sinn Direct.